The Graduate Student Council is considering a motion which would oppose the placement of graduate resident tutors in off-campus living groups until their responsibilities are more clearly defined. 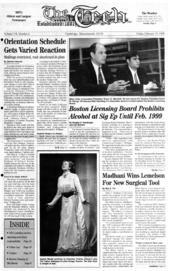 Every MIT-approved residence will have a resident advisor by the Fall of 1998, said President Charles M. Vest in a Dec. 9 press release. The plan was a result of the housing discussions following the death of Scott S. Krueger '00. The motion, which was introduced at the Feb. 4 meeting of the GSC by Omri Schwarz G, noted that under the current alcohol policy, graduate students "will be expected to act to prevent underage drinking. "Graduate students have neither the means nor the training to carry out such a duty," the motion continued. The resolution would force the GSC to oppose placing GRTs until a "specified list of duties for the resident advisors that explicitly excludes all law-enforcement duties not already applicable to every resident of the Commonwealth of Massachusetts" is agreed upon. The motion further states that the "GSC opposes any action that would make graduate students legally liable for the behavior of other students." "I was motivated by a concern that [resident advisors] and [graduate resident tutors] would not only become liable for incidents they haven't the capability to prevent but will also be hampered in any endeavor to mitigate the consequence of any such incident by their role as policeman," Schwarz said. The motion also says that the move to put GRTs in living groups cannot "absolve members of the administration of their proper responsibilities in these areas." Implementation aside, Schwarz questioned the need for tutors in the ILGs. "Personally, I see no reason to put tutors in the ILGs," he said. The changes could be counterproductive to the workings of the living groups, since it may be difficult to fully integrate non-members into the community, he said. While placing tutors in the ILGs was a good idea, "without a clear definition of what their responsibilities are, I can't recommend it," said GSCPresident Geoffrey J. Coram G, adding that he is concerned that GRTs would be forced to act "like policemen." However, Coram said that graduate students could be a positive influence on ILGs and provide "someone with a little more maturity." Neither Coram nor Schwarz were aware of any details concerning how the plan to move GRTs into living groups would be implemented. In late January, Vest reported that no additional progress had been made on the plan. The motion will be discussed and voted on at the next GSC meeting on March 4.